By: Russell James III, J.D., Ph.D.
To begin the topic of valuing charitable gifts of property, it is useful to consider why this topic is so important. As discussed previously, the vast majority of wealth in this country is not held in cash, savings accounts, checking accounts, or money market accounts. Consequently, if fundraisers wish to ask for gifts of wealth, then, by and large, they must ask for gifts of property. In other words, if fundraisers want to ask from the “big bucket” of wealth, then they need to ask for gifts of property, meaning any type of non-cash asset. A fundamental requirement of being able to ask for these property gifts from the “big bucket” is an understanding of how such gifts are valued for tax purposes. As we will see, this is no small issue. Different types of assets in different types of transactions may be valued dramatically differently, including a valuation of zero dollars. In order to be able to learn how to ask from the “big bucket”, it is essential to have a basic understanding of how gifts of property are valued. A fundraiser or advisor who suggests a charitable gift of property while being unaware that the deduction in that particular case would be far less than the value of the property is creating serious potential problems. This chapter is intended to eliminate that risk by reviewing the rules for valuing charitable gifts of property. If you are familiar only with cash gifts to charity, then this issue of valuation may be new to you. Cash gifts include all cash equivalent transactions such as checks, currency, or credit cards. Gifts of cash require no valuation. The value is simply the amount of the gift. Because the valuation is simple, calculating the deduction is also simple. Although cash gifts are simple, the bulk of a donor’s wealth is rarely held in cash. Understanding gifts of non-cash assets opens up the possibility for many more sophisticated and beneficial conversations with donors. The simplicity of valuation with cash or cash equivalent gifts contrasts with the complexity of valuing several kinds of property gifts. An initial cause of this complexity may come from the difficulty inherent in valuing certain types of property. Additionally, there are special tax rules for charitable gifts of certain kinds of property which can themselves alter the valuation of the property for tax purposes. These rules have at times been put in place to curb abuses of the charitable gift tax deduction. Because many of these rules were created in a reactive fashion – responding to particular individual abuses – it has resulted in a hodgepodge of rules that are not always consistent. Consequently, because so many specialized exceptions have arisen over the years, it is not always enough to know a single approach to the valuation of charitable gifts of property. Nevertheless, there are some general principles that apply to most gifts of property. Despite the variety of rules and exceptions, the most typical valuations fall into three categories. With a few exceptions, the value for tax deduction purposes of a charitable gift of property will be (1) the fair market value of the property, (2) the cost basis of the property – only where such basis is less than the fair market value of the property, or (3) nothing. Notice that the most advantageous valuation that a donor can receive under any circumstances is the fair market value of property. This is an important fact because when working with donors, the almost universal expectation is that the charitable gift of property will generate a charitable deduction equivalent to the value of the property. Asking for property gifts that generate no deduction or a much reduced deduction without understanding that reality in advance places the fundraiser or advisor in a highly unfavorable position. Thus, as a prerequisite to suggesting charitable transactions involving property, the fundraiser or advisor must be familiar with the rules for deducting such property gifts in order to avoid embarrassment, financial loss, and broken relationships. So, let’s explore these three most common valuation options for property given to charity. Cost Basis: What you paid for it less depreciation deductions already taken. One of the common valuation options for charitable gifts of property is the property’s “cost basis,” or what is referred to more technically as “adjusted basis.” The term cost basis is used here because, in most cases, the adjusted basis is simply the amount paid for the item by the donor (i.e., its cost to the donor). So, if a donor paid $100 for an item that is now worth $200, the deduction for giving that item to charity will be $100 if the gift is valued based on its cost basis. Note that the cost basis valuation of charitable gifts of property is never used when the cost basis is greater than the property’s fair market value. Cost basis valuation of gifts of property can only lower the value of the gift compared with its fair market value, not raise it. The cost basis of property can include other items besides the initial purchase price. For example, if a person purchases a house for $100,000 and then spends $30,000 on an addition to the house, his basis in the home is $130,000. So, the basis of a property includes both its initial purchase price and any subsequent capital expenditures. Calculating the basis of a property becomes more complex if it involves depreciation deductions. Not all property is subject to depreciation deductions. However, this is common with property that has been used for business purposes. A depreciation deduction allows a person to claim that the property has become less valuable because it is wearing out. For example, if someone purchases a $5,000 computer for her business, she can claim that after one year of use the computer is worth $4,000. Consequently, she will have a depreciation deduction of $1,000. She can do this for each of the first five years that she uses the computer in her business until, after five years, it is completely depreciated. If after five years she has taken depreciation deductions of $5,000, her basis is $0. She paid $5,000 and then deducted $5,000 of depreciation deductions, so $5,000 – $5,000 = $0. Depreciation deductions affect charitable deductions for gifts of property because a taxpayer can’t deduct the same item twice. So, if a $5,000 computer purchase has already generated $5,000 of deductions (through depreciation), the taxpayer cannot then give it to charity and generate another $2,000 deduction (even if it is truly worth $2,000). This would mean deducting the same item twice. As a result, the value of property for purposes of determining the charitable deduction is always reduced by any depreciation deductions that have already been taken. This is true both for gifts that are valued at cost basis and for gifts that are valued at fair market value. Of course, not all property can be depreciated. In fact, depreciation is not a concern in most property gift transactions. But, it is an important concept to keep in mind for those cases when it does arise (primarily physical items used in business operations). Current Fair Market Value: Its value on the open market (less any depreciation deductions already taken). When valuing an item of property to be given as a charitable gift, the initial issue is, for almost all transactions, “Which of these 3 valuation approaches apply?” How will the item be valued for purposes of the charitable tax deduction? Will the donor be able to deduct its fair market value, its basis, or nothing at all? Next, we review the basic framework that determines which of these deduction amounts the donor can use. When proceeds from the sale of the property would have been considered ordinary income if the donor had sold the property (rather than given it to a charity), then the donor may deduct only his or her basis in the property. For example, if a cobbler received $100 for selling a pair of his shoes, this money is considered to be ordinary income. Selling shoes is his ordinary business. If the cobbler gave a pair of shoes that normally sells for $100 to a charity, his deduction would not be $100 (the fair market value). Instead, his deduction would be limited to his cost basis in the shoes (i.e., his cost of materials in the shoes). Similarly, if an artist painted a painting and gave it to a charity, her deduction would be limited to the cost of the canvas and paint used in the painting. Just as with the cobbler selling shoes, if the artist had sold the painting, the money from the sale would have been taxed as ordinary income to the artist. The only type of non-cash property that has a chance of being valued at fair market value for a charitable deduction is long-term capital gain property. We begin with the assumption that long-term capital gain property can be valued at its fair market value for charitable tax deduction purposes. However, several circumstances can cause long-term capital gain property to drop out of fair market value valuation and be reduced to cost basis valuation. Capital loss property is property that is worth LESS at its sale than the owner orginally paid for it. In that case, the fair market value would be less than the cost basis of the property. 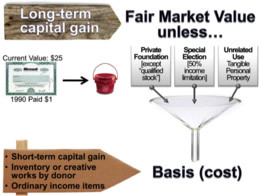 If the fair market value is less than the cost basis of the property, then the donor cannot deduct the fair market value regardless of what kind of property is being gifted. If the donor is contributing loss property, short-term or long-term makes no difference for gift valuation. In practice, donors should never give capital loss property. Instead the loss should be realized and deducted upon the sale of the property. For example, if a donor bought a share of stock for $110 and it is now worth $10, it is better for the donor to sell the share and then give the proceeds to charity, rather than to give the share directly to the charity. If he sells the share, he will recognize a loss of $100 ($110 purchase price less the $10 sale price). This loss can offset other gains that he might otherwise have to pay taxes on. But if he gives the share directly to a charity, he loses the ability to recognize that loss, and so he loses a valuable tax benefit. The charitable tax deduction is the same whether he gives the share directly to the charity or sells the share and then gives the proceeds to the charity (i.e., $10). This is why capital loss property should not be given directly to the charity, but instead should be sold and the proceeds given to the charity. Now consider some examples that demonstrate how these rules function with specific gifts. EXAMPLE 1: Suppose that a donor owns a share of stock that he paid one dollar for in 1990, which today is worth $25. He gives that share of stock to a public charity. How much could he deduct for that charitable gift? Notice that the stock is long-term capital gain property. Why? First, it has gone up in value, therefore, it is gain property. Second, the donor has owned it since 1990. This means he has owned it for more than 12 months and, therefore, it is long-term capital property. Because it is long-term capital gain property, this means that the donor can deduct its fair market value (in this case, $25), unless one of the three exceptions applies. In this case, none of the three exceptions apply. The donor is not giving the property to a private foundation, but instead is giving it to a public charity. The donor has not made a special election to reduce the valuation, so that exception does not apply. And finally, this is intangible personal property, therefore, the third exception, which relates to tangiblepersonal property, does not apply. Because none of the three exceptions apply, the donor can deduct this gift at its fair market value of $25. EXAMPLE 2: Now suppose the donor has farmland that he purchased for $600 an acre in 1990, which is now worth $1800 an acre. He contributes this farmland as a gift to a private foundation. How much per acre can he deduct for this gift? As before, we begin by recognizing that this is long-term capital gain property. First, it has gone up in value. Second, the donor has owned it for more than 12 months. Because this is long-term capital gain property, the donor can normally deduct its fair market value, unless one of the exceptions applies. The donor has not made a special election to have his gift’s valuation lowered, so that exception does not apply. Similarly, this is not tangible personal property. (It is real property.) Therefore, the tangible personal property exception does not apply either. However, the donor has made this gift to a private foundation. Consequently, he will not be able to deduct its fair market value, unless it is “qualified stock.” Clearly, this is not any type of stock shares, because it is real property. So, this exception to the exception is not relevant. As a result of making this gift to a private foundation (since it is not “qualified stock”), the donor’s deduction for the charitable gift of land will be limited to its cost basis. In this case, that means that the donor’s deduction will be limited to $600 per acre. EXAMPLE 3: Next, consider an example involving a different kind of property. Suppose a donor purchased an antique toy car six weeks ago for $1. This was quite a good purchase, because today the value of the antique toy car is $25. The donor’s plan is to give the toy car to a museum of toys that is also a public charity. The charity is interested in the car for its historical value and intends to display the car in its museum collection. How much can the donor deduct for the gift of the antique toy car given to the public charity? Thus, for gifts of property of $5,000 or more, all of this documentation is required: Charity receipt with gift date, location, and description and quid pro quo statement, donor records of gift, charity, date, location, fair market value (and basis if relevant), IRS Form 8283, and a summary of a qualified appraisal attached to the tax return. If any item is absent, no deduction is allowed. The highest level of documentation is reserved for gifts of property over $500,000 or gifts of artwork over $20,000. As before, publicly traded securities are exempted from the appraisal requirement because their valuation is relatively simple. Note that these are the gifts with the greatest potential for abuse. Gifts of property over $500,000 may be subject to a variety of interpretations of fair market value. And, given their value, such differences of opinion can have a dramatic difference on the payment of taxes. Thus, these large gifts warrant the most careful scrutiny by the IRS. Because these types of gifts will be subject to the highest level of scrutiny, it makes sense that the entire qualified appraisal must be included with the tax return. Not only are very large property gifts included (over $500,000) in this highest documentation level, but even moderately size gifts of art are also included (over $20,000). This reflects the challenges in the valuation of artwork and the consequent opportunities for abuse. Remember that for some taxpayers combining both state and federal income taxes can make deductions worth $.50 on the dollar. Thus, if a valuation were made that was more than twice what the donor could actually sell the property for, it becomes more profitable to give rather than sell the property. This potential for over-valuation is much more likely with property, such as artwork, where intrinsic value is difficult to define. As a reminder, appraisals are not required for gifts of publicly traded securities, regardless of the size of the gift. Thus, a donor could deduct a $10 million gift of Microsoft shares with no appraisal. However, if the gift was $75 or less, the charity is not required to report the quid pro quo part of the transaction (i.e., they do not have to report the cost or value of the item given to the donor). The rule applies only to the charity’s reporting requirement. The donor must still reduce his or her deduction by the value of the item received in exchange for the gift. The donor can ignore the value of the item received by the charity in exchange for the gift only when one of twode minimis exceptions applies to the donor. First, the donor can ignore the value of the item received in exchange for the donation if its value does not exceed 2% of the value of the donation. This exception does not apply to items received that are worth more than $104. (Note that this $104 level is a 2015 inflation-adjusted number that changes every year.) Second, the donor need not consider the value of the item received in exchange for a gift if the cost of the item to the charity was equal to or less than $10.50 so long as the gift made in order to receive the item was at least $52.50. (As before, these are 2015 numbers that are adjusted annually for inflation.) These de minimis rules are intended to reduce reporting hassles for items of an inconsequential amount. Although admittedly among some of the least interesting rules related to charitable gift planning, these documentation rules are nonetheless important. The penalties for violating the rules can be severe and typically there is no opportunity to correct documentation errors after a deduction has been erroneously taken. Disclaimer: This document may only be used as a reference. Contact your attorney and/or accountant for current rules and regulations as of the dates of your donation.